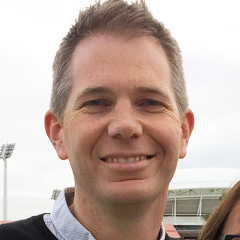 Des commenced his role as Senior Pastor of Trinity Church Adelaide in 2017. He leads our work of making, maturing and multiplying disciples of Jesus in Adelaide and beyond. An Arts/Law degree from the University of Tasmania prepared Des for his first career as a lawyer in Hobart. After four and a half years he moved to Sydney to acquire a Bachelor of Divinity from Moore College, which also resulted in him meeting and marrying Suzie, who has also studied at Sydney Missionary and Bible College. From 2011 to 2017, Des was Lead Pastor of the Christian Reformed Church of Kingston, Tasmania, where he and Suzie were joined by three, new little Tasmanians: Dan, Sam and Jemima (Mim). Des credits his Christian mum—who took him to church as a child, read the Bible with him, and prayed for him—with preparing him for his initial commitment to Jesus at the age of 14. This commitment was then followed up by a deeper understanding of the gospel when he moved to university and committed his life to Christ. There’s not much spare time with three little kids, but spending time with his family, drinking something cold on a hot day, eating Vietnamese or Italian food, or watching a movie are some of Des’ favourite things to do when he gets the chance.